There are two questions I hear most often. 1. How long did it take? 2. What is it going to be? These are hard questions to answer. I admit that I stumble around to find satisfying answers. 1. How long? Hours and hours. 2. Cloth. It is going to be cloth. What will the cloth be used for? I don’t know. But when I need a little something with a pretty design, I’ll know where to find it. 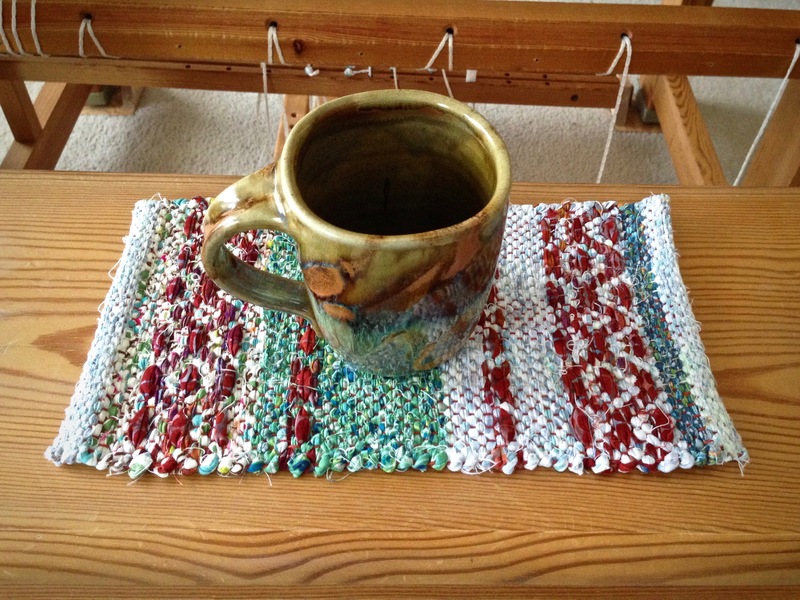 There are two finished pieces, though, from this first drawloom warp: the Heart-Shaped Baskets table runner (adapted from a pattern in Damask and Opphämta, by Lillemor Johansson), and a small opphämta table topper that I designed on the loom. The rest are samplers, experiments, tests, and just plain fun making-of-cloth. 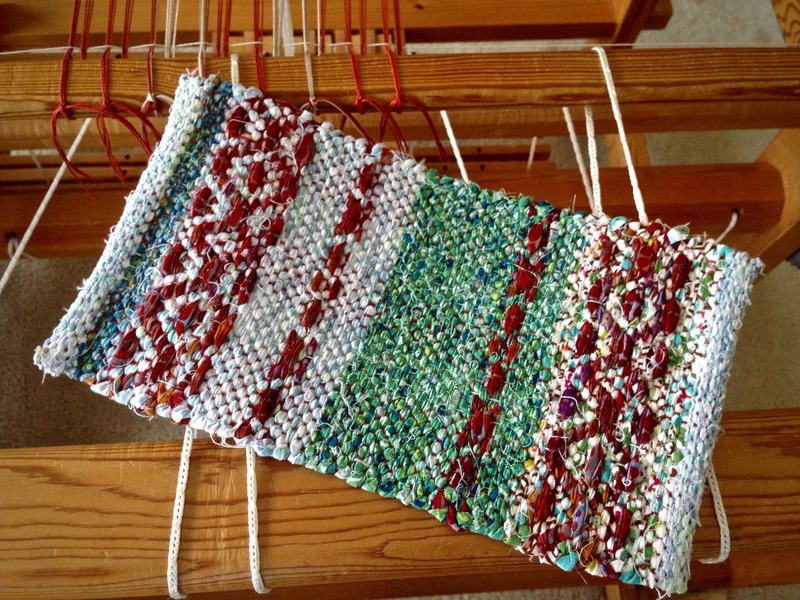 Oh, and I wondered if I could take the thrums and make a square braid…just for the fun of it. 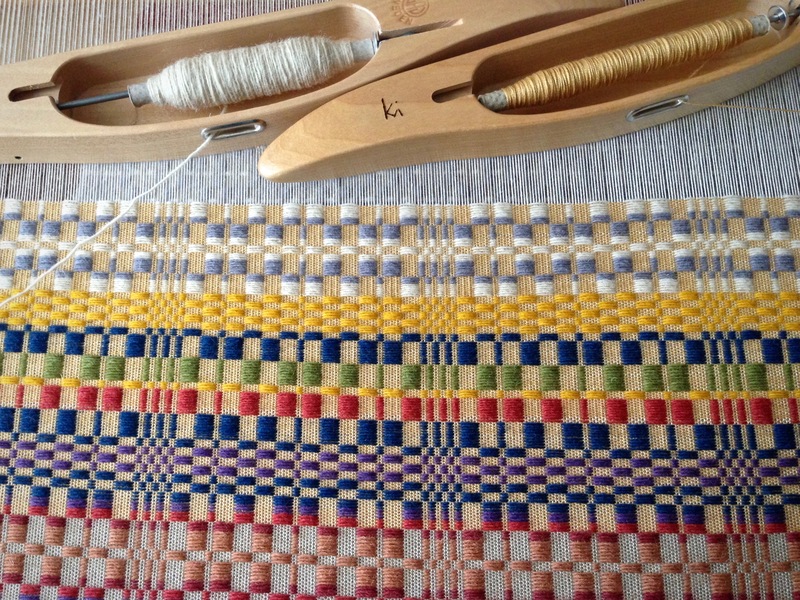 Opphämta piece on the left, with Fårö wool pattern weft. 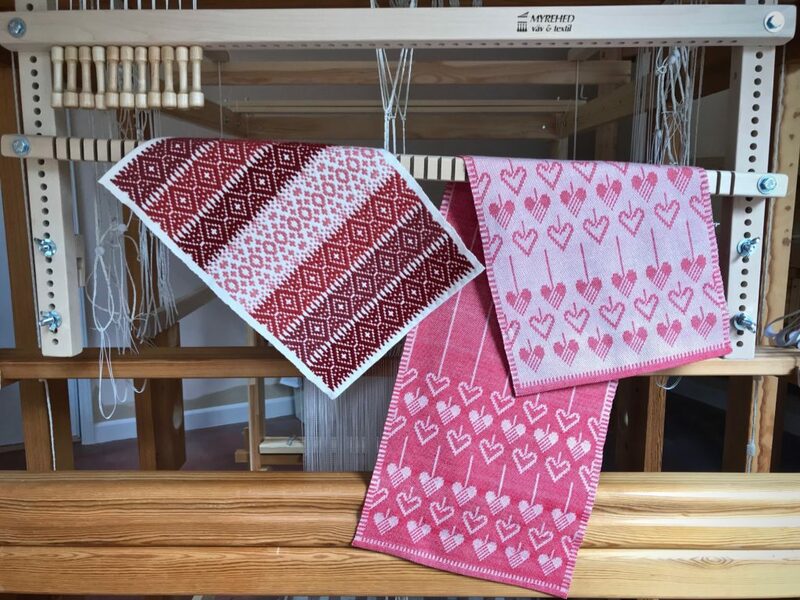 Heart-Shaped Baskets runner on the right, with red 16/2 cotton pattern weft. Ten pattern shafts. I will let the pictures tell the story of this first drawloom warp. May you have plenty of things to make just for fun. They are both beautiful! I love the blanket stitch look around the heart piece. Hi Beth, Thank you so much! Ah, blanket stitch – I hadn’t thought of it as that, but you’re right, it does have that look. I like having a border. Thank you…looks amazing! Your last comment gave me pause. I spin all the time for the enjoyment and just to make the yarn. However, I really weave with project in mind, never just for the enjoyment and experimentation. 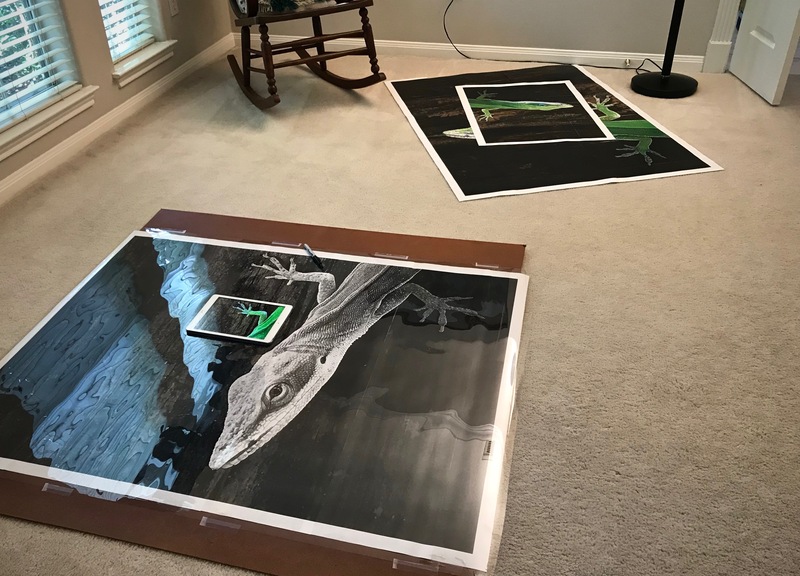 Going to have to change…..
Hi Karen, Sometimes we’re too hard on ourselves and strive to be “productive.” But there is value in doing creative things just for the sake of being creative. Besides being fun, that’s where a lot of learning happens for me. So beautiful! 10 total shafts needed for the heart runner? 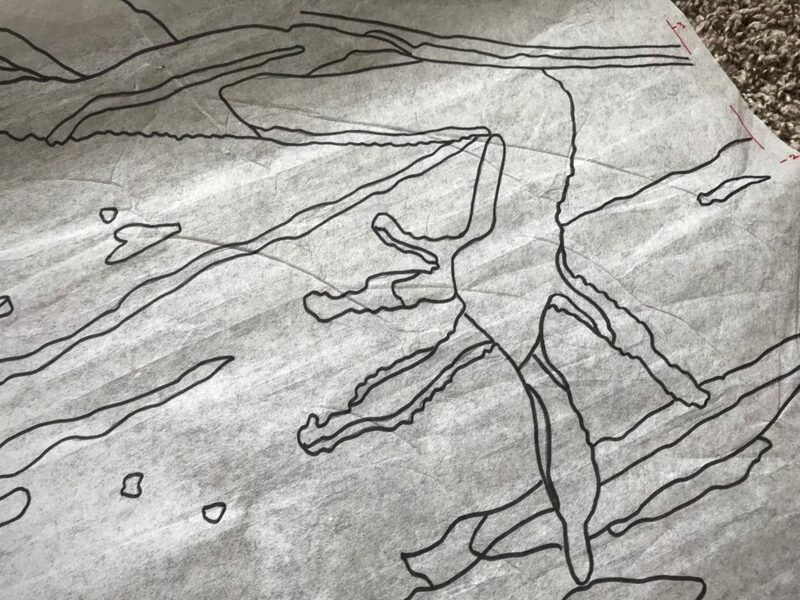 Do you sell the pattern or is it available somewhere? Hi Joni, there are 4 ground shafts and 10 drawloom pattern shafts, plus the “x” shaft for selvedges. The pattern is in “Damask and Opphämta,” by Lillemor Johansson. Without a drawloom, this pattern would need many more shafts. 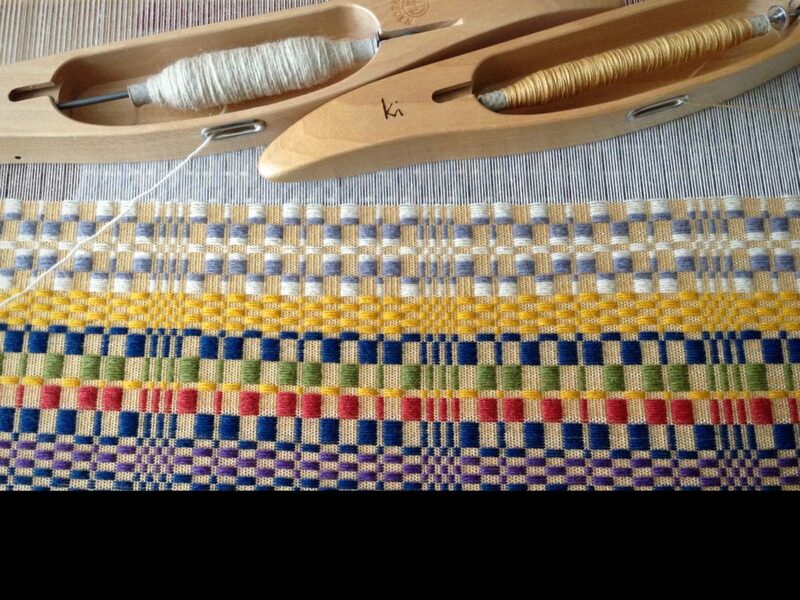 Man, when someone asks me how long it takes to weave, the answer is always different. 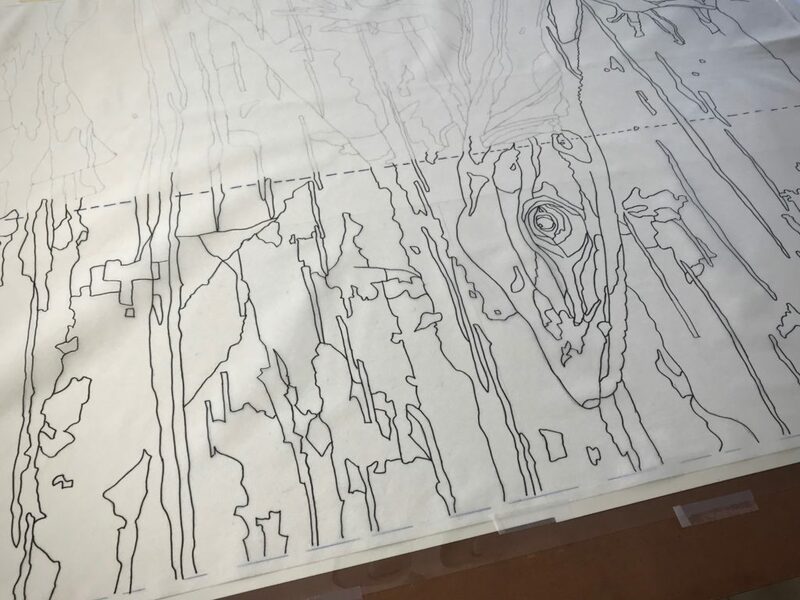 So much goes into the designing, warping and threading that makes it hard to calculate time. As you know, some pieces are less labor intensive than others. Hi Linda, So true! There are so many variables. Wow, Karen! Each piece is beautiful! It would definitely be fun to create all those designs. Hi Annie, It’s been so enjoyable to see the possibilities for designs. I made a few of them by re-working some old cross-stitch patterns. Colorful Fårö wool is used for the monksbelt pattern weft. 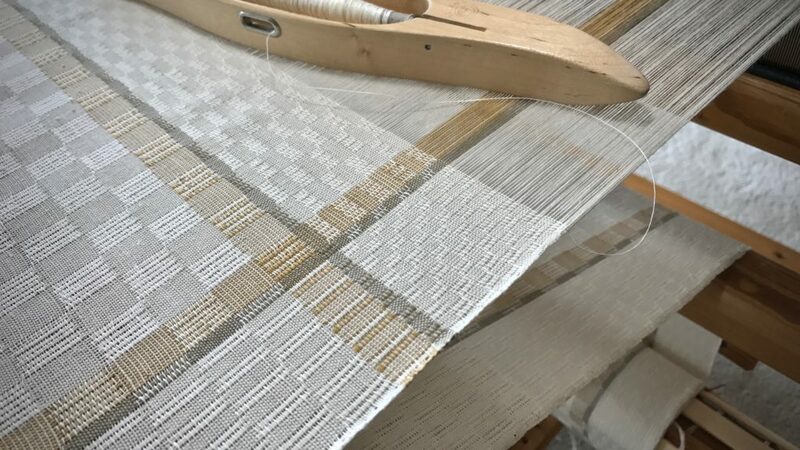 Plan projects from start to finish, dress the loom single-handedly, use complex threading and complicated treadling, and weave with multiple shuttles. Do you relish these challenges? 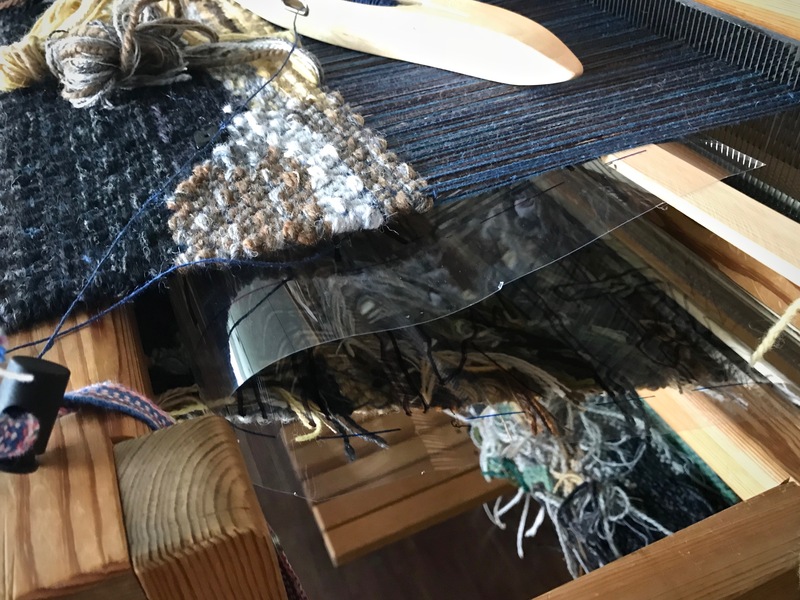 It is possible to weave things that don’t require as much training or practice. You can find a pattern on Pinterest or in a magazine, and do what “everybody” is doing. Not much is required of “everybody” in the crowd. Classic monksbelt patterning is repeated with different color variations. 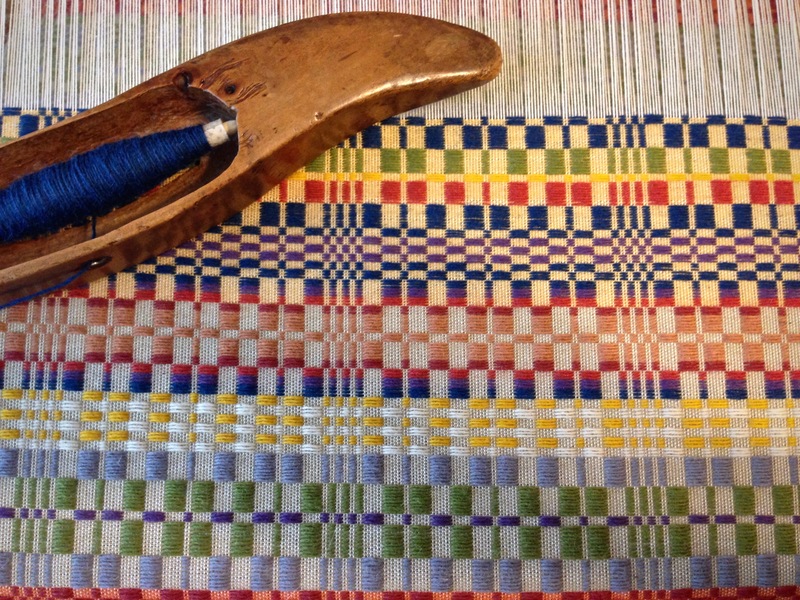 Swedish overshot, such as monksbelt, uses two shuttles–one for fine thread, and one for the thicker pattern weft. 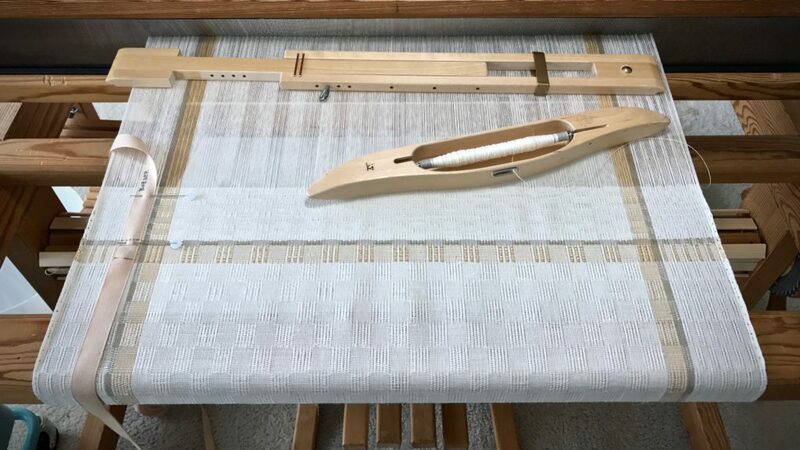 Warp is 16/2 cotton. Ground weave weft is 16/2 cotton. 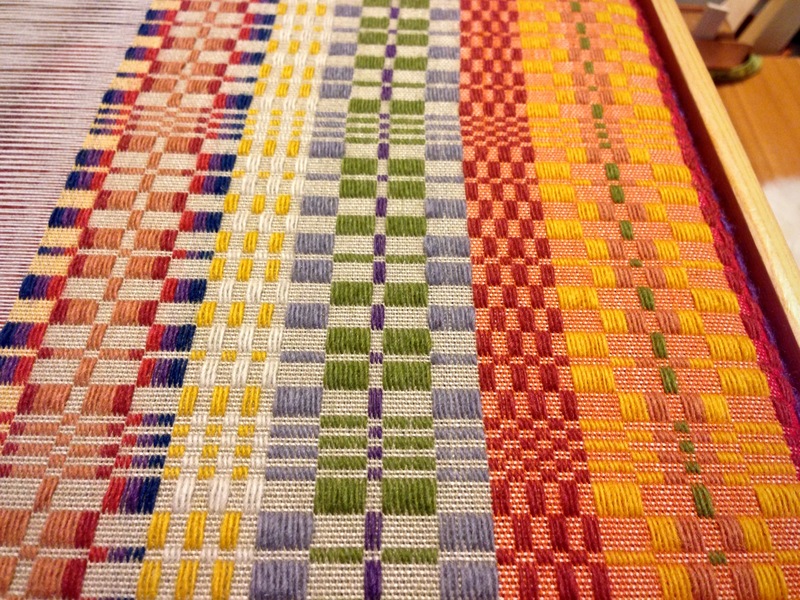 Pattern weft is 6/1 Fårö wool. Sett is 22 1/2 ends per inch. 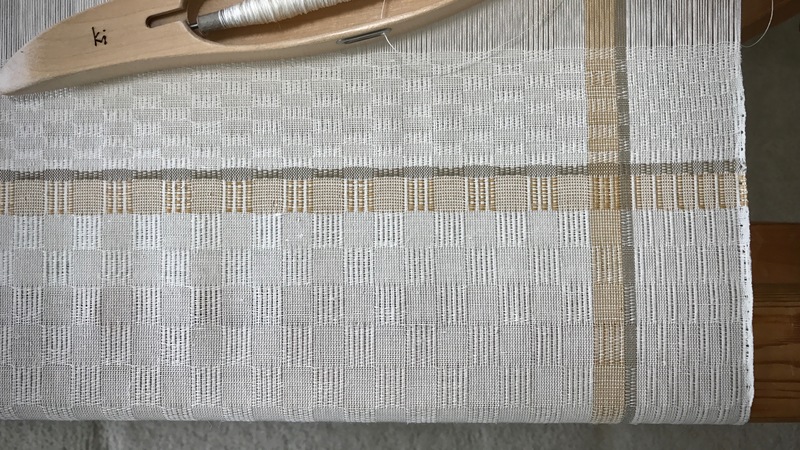 Weft density is 30 pattern picks per inch, with 2 tabby picks in between. But some people strive to learn, and practice what they learn, building on previous experience. Consider truth. You are responsible for the truth you know. The more you are taught, the more that is required of you. And as you practice the truth you know, you discover the freedom that comes along in the process. May you grow in experience. I’ve yet to try Monk’s Belt but your weaving is inspiring. Alaa, Thanks for your sweet words. 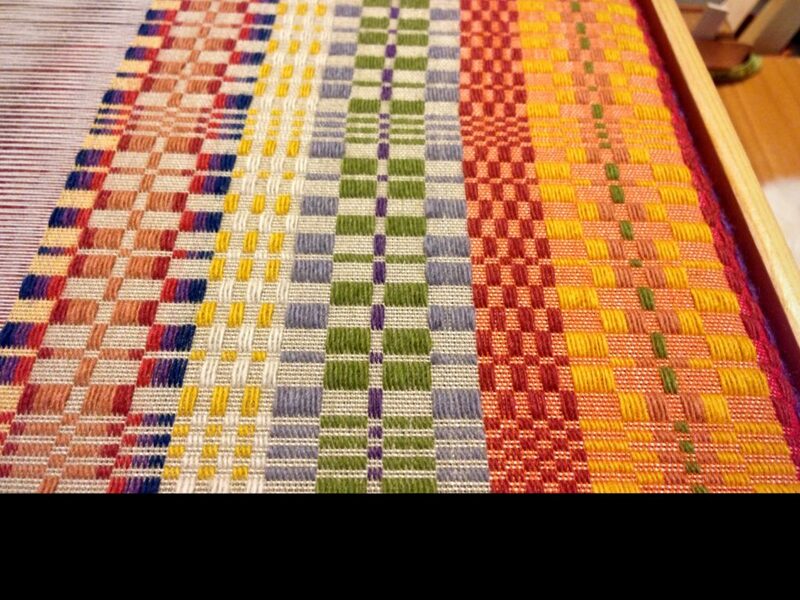 I hope you get to try this kind of weaving sometime. 4 shaft loom. Then I check out dice weave and halvdrall and my mind started to race with possibilities. 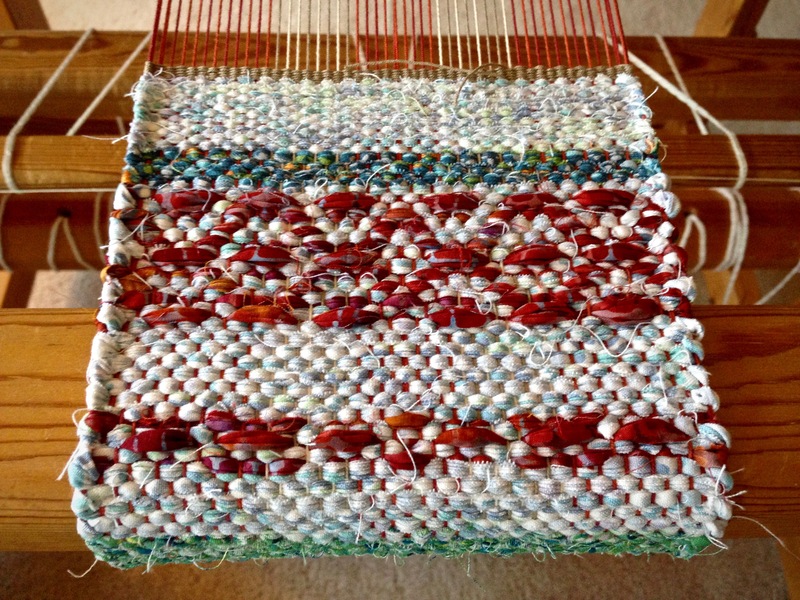 Weaving is great for starting the creative process. 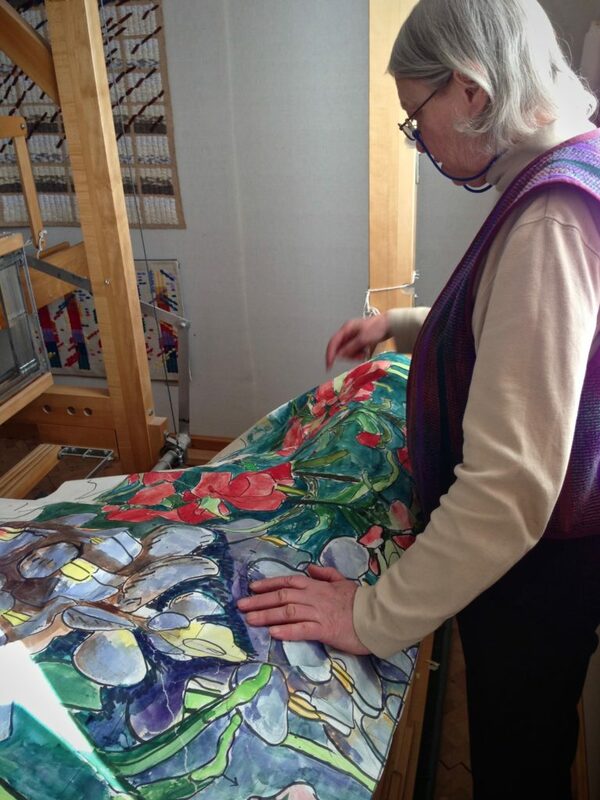 Marie, It does seem like magic to me, too, as the pattern shows up on the loom. I never tire of seeing the pattern develop with color. I love your monk’s belt with all the color changes in both pattern and ground. Hi Cindie, Changing the color in the ground weave gives monksbelt a whole new dimension that I wasn’t expecting. I’ve been pleasantly surprised. I’m glad you like it!